When your son or daughter joins Middlesex University they'll start an exciting new chapter of their life. They'll learn a lot about themselves and their capabilities as they become part of our academic community. Make sure you encourage your child to take part in the activities and events on offer during their first few weeks at university. 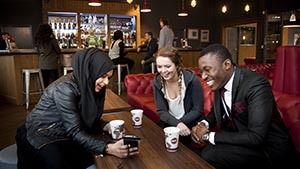 Socialising and networking with people from different backgrounds helps students learn how to work with different people and it expands their knowledge of different cultures. All this happens during their Welcome at Middlesex. 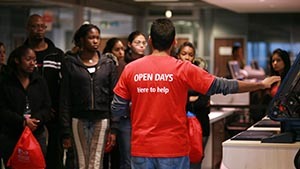 Details of their Welcome Week including academic and personal support that we can offer them. There are university-wide events from the Freshers’ Fair to a Thames Boat Party to a roller disco, for your child to meet students from across the University. Events include tea parties, cooking events, shisha nights, Harry Potter Studio Tours, cheese and wine nights and sporting events - whatever your child's interests or background, they'll find something to suit them. Your child will start their studies during the second week. They'll be learning in an independent academic environment and they'll be expected to take ownership of their learning experience with the support of staff and other students. Plan your child's departure with them. Will they want a lift to campus or help unpacking their things? Don't be upset if they don't want as much help as you'd like to give them. It's normal for young adults to want to assert their independence at this point, especially when moving into a new environment and looking to make friends. When Carol's son Greg started university back in September he was keen to start making friends on the first day; "Mum and dad helped me bring the bare essentials in a few bags. They dropped me off in halls, we had a quick lunch together then they drove home and I introduced myself to my new flatmates." Before starting university, your child will have a lot of forms to fill in. They might have a tenancy agreement to sign, they'll probably want to open a bank account, and of course, they'll be dealing with UCAS and the Student Loans Company. These are all valuable opportunities for them to gain a little independence before they leave home. By all means give advice, and help them when they ask for it, but also try to let them take the reins at this point. Independence is all about having confidence in your own abilities, and the best way to build that confidence is through the experience of handling your own affairs. Carol found she had to take a different approach with each child; "Megan took care of most of the forms herself, she was really organised. Greg was a different story, he kept leaving things to the last minute then coming to me for help. I tried to push him in the right direction as much as possible without taking over." You may want to help your child out by packing some food for them at the start of each term. This is a great idea, it can ease the cost of living and ensure they always have something available if they're eating dinner in a rush between lectures and a night out. However, don't look at this as an opportunity to get rid of all those tins of rice pudding and spaghetti hoops from the dusty back corners of your kitchen cupboards. Try to pack them some healthy options, so that when they're eating in a rush they can at least have a nutritious meal. For Carol's daughter Megan this was a sensitive issue; "Mum gave me a bunch of tins in case I didn't have time to shop at some point. It was a nice thought but I think I brought about five tins of custard and a load of tinned fruit home at the end of the year!" Don't be surprised if the sudden absence of your child leaves a big gap in your life. The house will be quieter, you'll possibly have less to do, and you may not speak to your son or daughter every day from this point on. Think about finding a new hobby or spending more time with other family and friends. Keeping yourself busy will ease the transition. Carol says; "The house seemed quieter when Megan left even though she's not generally very loud. Then with both of them gone I found myself at a total loss for a few months. I have a close friend whose daughter went to uni this year so we're having a lot of lunches together and talking it out." Don't call your child constantly to find out how they're doing. Remember, they're embarking on a busy new life; they're making friends and getting to grips with a new environment. They may not want you calling every evening to ask whether they ate a decent dinner. Having said that, make sure they know you're only a phone call away if they need advice on how to decipher laundry labels. Carol found it difficult not speaking to Megan and Greg as often at first; "I let them know we're here if they need anything, but I made a big effort to give them space. I didn't call every day, even though I wanted to." Don't convert your child's bedroom into a home office or start advertising for lodgers the second you get back from dropping them off on campus. This will make your child feel that you couldn't wait to get rid of them. The same goes for charging rent when they return for the holidays; your child may begin to feel unwelcome in the family home. You may think your son or daughter is an independent adult now because they've left home, but they will feel a lot more confident knowing they still have a place to stay if things don't go well. Carol wanted to make sure her kids still felt welcome; "My husband wanted to throw out Greg's bed and put in a pool table the day he left but I wouldn't have it. I wanted both the kids to know they still have a home with us whenever they need it." Now that your son or daughter is embarking on a life of their own, probably living away from home for the first time, take a moment to think of everything you've done for them in the past. This isn't so that you can throw it in their face, or tally it all up and present them with a bill. Just remember that they'll have to do all these things themselves from now on. 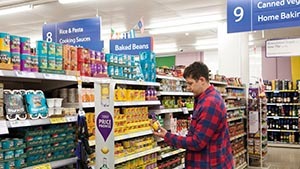 Make sure they can use a cash machine, separate laundry into whites and colours, tell whether chicken is cooked all the way through and open a tin of beans. Not only are these vital survival skills, they can also break the ice when your son or daughter comes across another student who can't boil an egg. This was a big regret for Greg; "I wish I'd taken the time to learn the basics before leaving home. Mum didn't really need to phone me at all in the first term, I was calling her all the time for cooking tips." Before your child leaves for university, try to instil in them at least a small awareness of how to manage a budget. Remind them gently that their first chunk of student loan has to last the whole term; they may come to regret buying that new winter wardrobe when they find themselves eating dry toast for breakfast, lunch and dinner halfway through November. You should also explain the concept of an overdraft, and how much it will cost them if they're constantly dipping into it. These lessons will set them up for life, and in the short term, prevent them having to make that embarrassing, confidence-sapping call to mum and dad begging for a loan. Megan learned this lesson the hard way; "Mum and dad warned me that the loan money wouldn't last forever, but in my first year I made a lot of friends and was out all the time so I bought a fair amount of clothes. By the end of the year I was scraping by and had to borrow money from mum and dad. I spent half the summer working to pay it back. I'm much more careful now." Obviously you'll want to see your child regularly, but try to discourage them from coming home every weekend. In the first weeks at uni it's important your son or daughter adapts to their new environment and spends time with other students. If they're constantly at home they'll find they're missing out on important bonding experiences and other students are forming friendships when they're not around. Carol didn't find this a problem with either of her kids; "Megan was pretty self-sufficient from the beginning, but as Greg stayed in London it's easier for him to travel back. He brings laundry home about once a month. I don't mind as it means I can always look forward to the next visit. A lot of his friends go home at weekends as well so he doesn't feel like he's missing out." Your son or daughter has finished school and gained a place at university. Although they've made the decision to remain at home during their studies, this is still a crucial stage in their development as a young adult. Many of the new friends they make at uni will be living away from home for the first time and enjoying their new found independence. It's likely that your child will want to keep up and will try to gain more independence. Recent Middlesex graduate Angela Manaj stayed at home while studying; "I still felt very independent. I was responsible for myself financially and for making important decisions. My mum was very understanding during the transition from school to university." Angela's mum, Silvia, also experienced a big change; "University is a big step not only for the student but also the family, therefore it was nice to have her at home during the process. Additionally, staying in London was the best decision for her as she had many opportunities to find work." Living at home while at uni doesn't mean your son or daughter should miss out on anything. They will still be invited on nights out and it's important that you don't stand in the way of their social life. Setting a curfew or arranging to pick them up at 11pm might give you peace of mind, but it won't help them establish strong friendships with their new peers. Allow them to take responsibility on nights out and plan their own journey home. Instead of calling to find out where they are, try encouraging them to text and let you know if they're going out after lectures. Despite living at home and having a busy schedule Angela still found time to engage in the social side of uni life; "I was part of several societies including the Criminology and Sociology society, the People and Planet society and the Baking society. I found all of these were great places to meet fellow students, and the first two also allowed me to discuss ideas from my course. I attended student union parties and halls parties, which all my friends also attended. Living at home didn't stop me from fully experiencing university life." You may feel fortunate that your child has made the choice to remain at home rather than move into university halls; you can keep an eye on them and protect them for at least another year. However, now is a great time for them to learn some self-sufficiency: allow them to find their own way to campus rather than dropping them off; let them set their own alarm in the mornings and decide their own bedtime; and make sure you allow them space to work independently and keep track of their own assignments. Silvia was impressed with how her daughter handled her new responsibilities; "Initially I wanted Angela to live away from home, thinking it would prepare her for adult life and make her more responsible. However, after watching her juggle her studies, work and social life while remaining at home and taking part in family life, I was very pleased she made that decision." Aside from getting qualifications, one of the most important aspects of university is gaining life experience. Extra-curricular activities give students the chance to hone their social skills and pick up new hobbies and interests that they may continue throughout their lives. Encourage your son or daughter to make the most of what uni life offers: university sports can be a great way to develop teamwork skills; joining a society or getting involved in the students' union can lead to lifelong friendships; and attending student events or nights out can form memories they'll look back on for years to come. Angela's mum recommended participating as much as possible in university activities; "My mum was always supportive of my decisions, but she also encouraged me to make the most of my time. That made a big difference to my university experience." It can be embarrassing to admit that mum still washes your underwear and makes you beans on toast every morning. Give your son or daughter the opportunity to feel as mature as their friends who may have moved out already. Suggest that your offspring do their own laundry or cook for the family once a week and you may find yourself surprised at their answer. Small things like this can give your child that important sense of maturity and ease your workload at the same time. Angela found this to be an important step; "As well as being responsible for my own finances, I also did all the other mundane stuff that I would have had to do if I lived away from home, such as cooking and cleaning." Gaining financial independence is another important part of the uni experience which your son or daughter doesn't have to miss out on just because they're living at home. Encourage them to take up a part-time job if their studies allow, this will not only teach them to manage their money carefully, but also their time. Once they have found employment, there's no reason why you shouldn't ask them to contribute to the household bills while they're still living with you. Explain that if they had moved out they would be paying the water, gas, electric and phone bills just as their friends probably are. Angela found working part-time a valuable addition to her university life; "Living at home helped me feel financially secure, I didn't have worries about paying rent. However, I still worked part-time while studying and therefore had more financial independence."